It's easy to envision the Lifestyle® 135 home entertainment system with your HDTV. But there's much more to this soundbar speaker system than its slim profile. Exclusive Bose® technologies help control your home theater sources with a level of ease not found in typical 1.1-channel systems. Add your 3D Blu-ray Disc™ player and other HD components to the system with guided setup. And enjoy simple, everyday use with onscreen menus for all your connected sources. 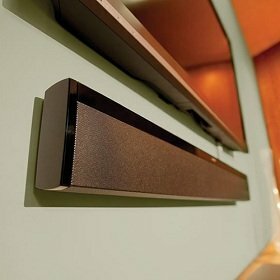 The sleek soundbar speaker can be flush-mounted on the wall to fit under your flat-screen TV. The slim speaker delivers exhilarating home theater audio that convincingly sweeps around your room. That cinematic sound is complemented by a wireless Acoustimass module for resounding low note performance. A control console features an AM/FM tuner and dock for your iPod or iPhone to round out a complete entertainment system. It's an easy, elegant, high-performance approach to home theater that fits your style. Thanks to TrueSpace® technology and advanced PhaseGuide™ array technologies you'll enjoy sound that's much wider than the speaker's physical size. You'll hear acoustic detail from the left, center and right, all from a single visible speaker that fits right in with your HDTV. The compact Acoustimass module is easily hidden from view but reproduces noticeable bass performance. The low notes and effects add a level of realism to whatever you watch, and more depth to your favorite music, too. And with the module's wireless technology, there's no speaker wire running from the soundbar to the module. The Unify® intelligent integration system walks you through system setup, step by step. As you connect components to the control console, the system recommends the best connectors via onscreen messages. It even confirms that you've made the connection properly. The wireless Acoustimass module can be place out of the way with no speaker cables to run from the module to the soundbar. Each device is then automatically added to the source menu accessed on your TV screen. No more toggling through video inputs to find the right source. If you add a Blu-ray player, it shows up as "Blu-ray" in the onscreen menu. This makes it easy and intuitive for anyone to use the Unify system. Unify technology also simplifies programming your Bose remote to control your Lifestyle® 135 system and most anything attached to it. During setup, the Unify system references an internal database to identify each connected component, and automatically teaches the Bose remote to control it. Plus, you can view system information, including iPod and FM/AM status, on the Bose remote's LCD screen. Your room is unique. And its size, shape, textures and other elements affect the sound you hear. The ADAPTiQ® system was developed to analyze your room and then adjust the Lifestyle® system's sound for a consistent, high-quality performance. This system also sets you up for a second room of sound with built-in Bose link technology. Add compatible Bose products and enjoy the home theater system's audio in as many as 14 additional areas, even outdoors. Unify intelligent integration system uses onscreen navigation to simplify system setup and everyday use. This proprietary technology walks you through setup, showing the right inputs and best connection options, and even verifies you've done it correctly. Clear, onscreen menus provide all the information you need for your connected sources. ADAPTiQ audio calibration system analyzes the way your room's dimensions and other variables affect sound, then automatically adjusts the sound of your speaker system to the acoustics of your room. Flexmount™ automatic placement compensation automatically detects the speaker's orientation - flat on a table, or mounted on a wall- and adjusts the sound to ensure wide, spacious sound. PhaseGuide sound radiators work with TrueSpace technology to direct sound with precision, sending acoustic detail to the left, right and center of your room. Control console with abundant inputs/outputs, including 4 HDMI® connections and 2 HD audio connections. Also features built-in AM/FM tuner. Wireless Acoustimass module produces deep low notes for added home theater realism. A wireless link allows for flexible placement and does away with any speaker cables from the module to the soundbar. Dock for iPod charges your iPod as you listen or whenever docked. Watch your video content on your HDTV and control it with the Bose remote. Compatible with most iPod and iPhone models. Bose remote features an LCD screen to simplify management of your entertainment sources. Works on radio frequency to operate through walls and floors. Bose link whole-home audio technology lets you connect compatible Bose products to your Lifestyle® home entertainment system for listening in as many as 14 additional rooms - even outdoors. Comes with full manufactures warranty.